Seth Thomas Sonora "Chime Clock No. 1", C. 1910. 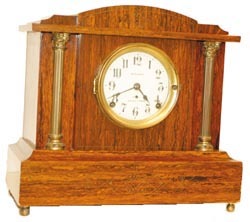 This clock is in very good original condition, brass never cleaned or polished, but not bad as it is. There are some very minor nicks on the corners of the base. One piece porcelain dial is signed, "Seth Thomas" and "Sonora Chimes". 8 day Seth Thomas movement No. 89M, and Sonora movement No. 90, with 4 bells. Correct back door with a label. Case is finished in Adamatine mahogany, rusty red with black swirls. 4 nice brass feet, gold gilt metal columns. Large heavy case is 13.5" high, 15" wide. Way above average overall condition. Ly-Seth Thomas, page 212.